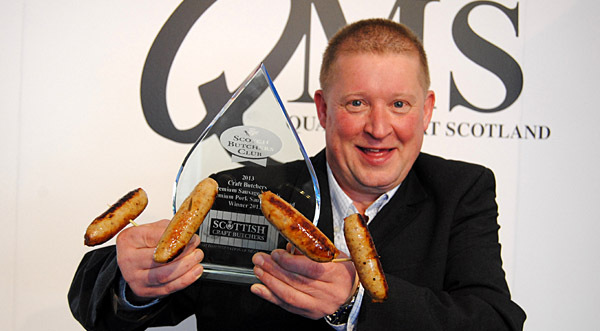 A sausage produced by a Fife butcher has scooped the title of Scotland’s top pork sausage in an award announced today (June 20th) at the Royal Highland Show. The “pork and mustard” sausage, made with Specially Selected Pork, from Robert Watson of Watsons of Leven lifted the top honours in Scotland’s new Craft Butcher Premium Sausage Awards, supported by Quality Meat Scotland. Mr Watson, whose father Robert farms at Croft Garry and Kirkton farms, Auchtertool, established his butcher’s business in 1990 and has a team of eight staff. Mr Watson said he was “over the moon” to have won the award, particularly as some of the other competitors were much bigger businesses. 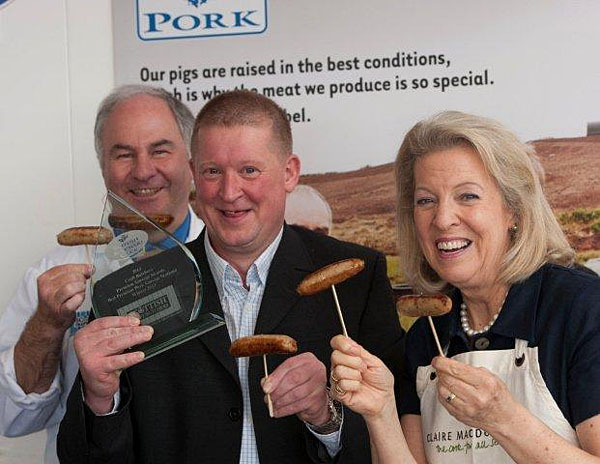 The award judges had previously sampled more than 100 of the country’s finest sausages in the course of finding the winning entry which was revealed on the QMS stand on the opening day of the Royal Highland Show. To celebrate the win show-goers were tempted with samples of the top sausage, along with some of the country’s most discerning palates, including acclaimed chef, Lady Claire Macdonald. Premium sausages are defined as sausages with a meat content of more than 72%. Premium beef sausages are required to be made from a minimum of 85% visual lean meat and pork sausages 80% lean meat. Butchers from around the country, from Ballater to Buckhaven, entered their top sausages which were judged for their performance under a range of criteria including taste and flavour, palatability; appearance, texture and general appeal. The line-up of beef sausages included beef, cheese and jalepeno, beef with Dijon mustard and beef, tomato and mozerella. Uel Morton, Chief Executive of Quality Meat Scotland, congratulated Robert Watson and the team at Watsons of Leven on emerging as debut award winners and emphasised the importance of the new awards. A survey of butchers by QMS revealed 92% of butchers’ shops experienced increased footfall in February (23 Jan – 23 Feb) following the media coverage of the horsemeat issue. A survey last month revealed that the vast majority of Scottish butchers are positive about how their businesses will perform over the next 12 months. Douglas Scott, Chief Executive of the Scottish Federation of Meat Traders Associations, said more consumers are discovering the creativity and innovation to be found inside their local butchers’ shop.